So then. That is all from me. But a reminder you can follow all the reaction, over here. What a win for Sam Allardyce's Sunderland, who continue to rise. A few Olés! ringing around the ground now. Stoke are still running but it's on empty. The home fans are enjoying this - a rare win! The home fans reckon they are there already. A very big win this. And Sunderland are running riot! Jeremain Lens fluffs his lines, blazing wildly over. "Watmore has talent and is so direct. He has pace and when he gets beyond defenders he finishes expertly." A brilliant driving run and finish from Duncan Watmore - low and hard across the keeper. Surely that is that. A massive win for Sunderland this. From a free-kick played short, Patrick van Aanholt blitzes one home on his left foot and Jack Butland is finally beaten. Is this two wins a row? Are they out of the bottom three now? Jeremain Lens brought down by Glen Johnson! The ref says no! Again! Jeremain Lens picks out Steven Fletcher at the back stick, but Erik Pieters is there to intervene! Under 10 minutes to go here now. This would be a fifth consecutive clean sheet in league and cup for Jack Butland and co.
And they're looking pretty solid. Another shout for a pen from the home fans - and again it's Steven Fletcher who's leading the call on the pitch. He went down under Philipp Wollscheid's challenge. There was a minor tug. Minor. But nothing more. Sometime's you've just got to take your captain off. John O'Shea makes way for Adam Johnson. Can he wing his way into an opening for Sunderland? The final change for the home side. Duncan Watmore may be full of energy but it has to be said - his touch ain't great. Control lets the youngster down when he's found in the box - a rare opening in what's been a pretty tight last 10 minutes. Especially surprising when you consider the numerical advantage. A better touch and he was in. What a big last 20 minutes or so for Sam Allardyce's team. Can they make this count? Stoke seem to be dropping deeper... Is it gonna be all-out defence for them from here? Even with the extra man Sunderland are struggling to get on top. They had a little burst after Ryan Shawcross' red card, but there's no real sign of another spell like that turning up soon. Lee Cattermole tries to rally the troops - just after almost playing DeAndre Yedlin in with a delicious through ball. Sunderland have definitely been pressing higher up the pitch since the sending off. But they've not been able to do much with it when they have won the ball back, and Stoke are still bossing possession. Who's got 10 men again? Mame Biram Diouf - a striker - on for Xherdan Shaqiri, who has done a lot in front of goal with little impact. Diouf's muscularity could be exactly what the Potters need up top. Was that a push by Geoff Cameron on Steven Fletcher in the box? The Sunderland fans thought so - up went the roar - but there's nothing in it. Cameron had his hand on him but no foul. What a chance this is for Sunderland to claim three points. Victory would be just their third of the season - and the third since Sam Allardyce took over in October. What a save, to tip over from Seb Coates' header. Real acrobatic stuff, and presumably great anticipation, too. Sunderland are cranking up the pressure. The first big one since the sending off and Yann M'Vila fluffs it. A shanked effort straight at the keeper after Jeremain Lens' first touch to find him. Jeremain Lens is on for Seb Larsson. This could be tactical or it could just be Seb Larsson is knackered - he certainly looks it. This is a long time to play a man down. Can Stoke see it through? Right now there's not been much of a change in the way the game has been played since the restart - Stoke are still on the front foot. A reshuffle. Bojan is the man to be sacrificed, with defender Geoff Cameron coming on to shore things up at the back. What shape will Stoke go to know? 4-4-1 with Jonathan Walters the lone man? I was just in the middle of writing about Duncan Watmore - who is full of running. He's been a constant thorn in the side of the Stoke defence, and Ryan Shawcross couldn't deal with him. He bundled the youngster down as he tried to elbow his way through on goal. The ref had no choice but to brandish a second yellow. Now this is going to change things, big time! The players have clearly been enjoying their half-time oranges - they're only just emerging now. Taking up the full compliment of their 15 minutes. And fair play to them, workers' rights and all. All square then. It finally livened up though! Now then. No appeals from Bojan - who was closest to it, but did Costel Pantilimon just handle outside of the box when collecting a through ball? It was tight, I tell you - his body gets in the way of the angle on the replay - but I reckon it was just inside. ANOTHER Stoke corner - they are finishing the stronger. Can Sunderland keep their concentration? Just about. Charlie Adam rises to head but it's over. A difficult chance, he had to re-position and flick behind himself towards goal. Well it looked like Sunderland were cooking but Stoke have done well to build slowly, soaking up the pressure. They win a corner - the last of the half? - and Glen Johnson is looking to shoot on goal after the short one. He's pressed back though, two minutes to be added on. Free-kick on the edge of the box, how many times do they actually go in? Patrick van Aanholt's effort is another that goes straight into the wall. There's still time before the break though. Something's brewing, you feel. Yellow card for Ryan Shawcross, it was a rugby challenge on Steven Fletcher - the Sunderland man had knocked it past him and might well have been through on goal. Sam Allardyce is making the point on the sidelines. Brilliant intervention by Ryan Shawcross to put the ball behind. Sunderland with another corner - their third in about five minutes - which is clawed out by Jack Butland. ... which is headed back across goal by Younes Kaboul but then away by Charlie Adam. Stoke break, find Bojan jinking on the edge, Xherdan Shaqiri to Marko Arnautovic behind the lines... but he's offside. Now Sunderland counter - this is picking up! Charlie Adam picked up a yellow card for a foul on Lee Cattermole a few moments ago - a sign that Sunderland are edging the midfield battle? They're certainly full of intent. Since Duncan Watmore came on the energy levels seem to have risen a notch. Get involved with the debate via Twitter #bbcfootball or text us 81111 (UK only and don't forget to include your name and where you're texting from). Nobody can doubt Glen Johnson's attacking intent. The Stoke right-back (number eight) is one of their most attacking players as this average positions map shows. His Sunderland counterpart, DeAndre Yedlin (number 24), hasn't had a chance to get going at all. Jonathan Walters is denied by the legs of Costel Pantilimon! A brilliant, low, drilled cross from the left and all Walters needed was a touch to divert it. Unfortunately for him, Pantilimon's anticipation and reflexes were spot on. Best chance of the game. That is a real blow for Sunderland. How will they cope without their top scorer? It looked like goals were going be hard enough to come by anyway, with him on the pitch. Jermain Defoe is off. He looked to be fading in the last few minutes and he cannot continue. Duncan Watmore is on to replace him..
Sunderland with their first corner of the game too now, which is dealt with by Stoke. The first corner of the game is whipped in by Xherdan Shaqiri. Once again it's cleared, and when they nick it back Yann M'Vila does really well to recycle possession under pressure. It's very back and forth right now, with little penetration. Possession is looking a lot more even now to how it did after those first 15 minutes or so. Sunderland have improved since a poor start, and Jermain Defoe has come closest to finding the net. More patient stuff from Stoke but Sunderland are well drilled at the back. The away side have Bojan, Marko Arnautovic and Xherdan Shaqiri to move the ball quickly in front of goal but none can find the opening. "None shall pass", from the Black Cats. Panic over Sunderland fans. Jermain Defoe limped off but is more than happy to bounce back on. All he needed was a little rub. That seems to have woken Stoke up a bit. Here's Xherdan Shaqiri driving at the Sunderland back four, playing in Jonathan Walters out wide. Somebody shoot! Sunderland are lining up on the edge of the box but you can always rely on one man to shoot on sight - Jermain Defoe. He drives one low, which zips just wide of Jack Butland's right stick. He was a goner. This is a much better spell from Sunderland. Finally a bit of possession - and when they do give it away, the pressure is on straight away, forcing Stoke into an error. Sam Allardyce will be much happier with this. Ooh! That is a lovely move from Sunderland though. Steven Fletcher flicks one over the top of the Stoke defence, but it's just too long and zips away from Jermain Defoe, into the arms of Jack Butland. In fact, they've had this much of it. Stoke are looking the more dangerous here though. Younes Kaboul has to dive in to cut out a cross from the left, and you just feel their patient build-up play might bring the first goal - as opposed to Sunderland catching them with a quick break. The home side have barely had the ball so far. Another chance for Sunderland to counter as Stoke's intricate passing is cut short. It's their best move of the match so far but in the end Steven Fletcher's shot - hurried from an unappealing angle - is easily gathered by Jack Butland. A chance for Sunderland to break is missed. Marko Arnuatovic goes down looking for a free-kick - seemingly forgetting about the actual football - and Stoke can play it up field to Jermain Defoe. Instead of long over the top though - where he wants it - it's low and is intercepted easily. Defoe wheels his arms in frustration. A few empty seats on show at the Stadium of Light today. The home side have their first foray forward as Patrick van Aanholt takes a heavy touch in the corner. In his defence the surface does look sticky. Huge pressure on Lee Cattermole straight away from the impish Xherdan Shaqiri - he really harried him. The Sunderland man does well to keep the ball and turn with it, but his side soon give it away. Mark Hughes' side straight out of the traps. And we are under way. Ex-Sunderland and Ipswich goalkeeper Fulop died at the age of 32 on 12 November. He played 47 times for the Black Cats between 2006 and 2010 and last appeared for Ipswich Town in 2011, making 38 appearances for the Suffolk club in all. "Ryan Shawcross used not to know his limitations, and used to be a very rash defender. But now he's become a much more mature footballer, he knows he likes to be close to a striker and he's a much better player." Shawcross for England? Not while Roy Hodgson is in charge, according to Mark Hughes. The teams are on their way out of the tunnel now. John O'Shea is sucking in the atmosphere as the Ride of the Valkyries blares out. "Sunderland look a lot more solid now. I think there are only three or four managers who can turn it around in the Premier League and Sam Allardyce is one of them." "Sunderland have struggled the last few seasons. I worry about where their goals are coming from. Away from home they are very compact and made it very hard for Crystal Palace last Monday but is that something they can maintain? Maybe he is looking for that little bit of stardust. But I think it's a big job to keep them up." "Sam Allardyce is old school, and he has demands of his players. Now he'll have found out who his strong players are, so they can do his job for him in the dressing room. "For me, Sunderland have to play Fletcher and Defoe up front for 25 or 30 games together, because they have goals in them." "It's not taken long for Big Sam to get Sunderland moving in the right direction. Monday's win at Palace made it six points from five games, and if he can maintain that ratio he'll succeed in steering them to safety. "Playing five at the back at Selhurst Park worked and, apart from a horror show at Everton, Sunderland have looked more secure defensively. "And they will need to be solid against a Stoke side collecting clean sheets for fun, keeping five in their last six games to provide the platform for a string of 1-0 victories. "The first goal in this one may well be the last one." Sunderland manager Sam Allardyce makes one change from the team that won 1-0 at Crystal Palace on Monday – American DeAndre Yedlin replaces the suspended Billy Jones at wing-back. Top scorer Jermain Defoe is passed fit to start despite suffering an ankle problem at Selhurst Park, while forward Fabio Borini returns after missing that game through, again, an ankle injury, but only makes the bench. Sunderland XI: Pantilimon, Yedlin, O’Shea, Kaboul, Coates, Van Aanholt, Cattermole, M’Vila, Larsson, Defoe, Fletcher. Stoke manager Mark Hughes names an unchanged side from the team that won 1-0 at Southampton on Saturday – with midfielder Xherdan Shaqiri and defender Philipp Wollscheid both passed fit to start. Stoke XI: Butland, Shawcross, Wollscheid, Johnson, Pieters, Whelan, Arnautovic, Bojan, Shaqiri, Adam, Walters. Good news for Stoke supporters, you are fifth in our BBC Sport Predictor leaderboard. Sunderland are 11th in the table. Think you can help boost your team's fortunes? Just sign up and join your fellow fans in predicting the weekend's Premier League games. Bragging rights await! Wherever you're taking shelter from the rain today, welcome. Let's see if this encounter at the Stadium of Light can lift things a little. Stoke are unbeaten in their last four away games - and won three of those 1-0. Same again today? Or will Sunderland, buoyed by Monday's win at Selhurst Park - just their second win of the season and the second under Sam Allardyce - continue to rise? Defoe is fit - can he make the difference today?Image caption: Defoe is fit - can he make the difference today? 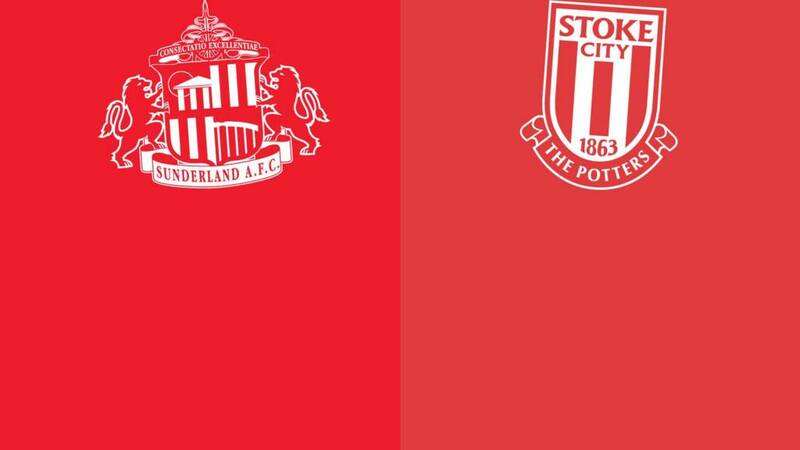 Welcome to our live page for Sunderland v Stoke City. We'll have text commentary here from 14:30 GMT. You can keep up to date with all the action from today's other Premier League games here.